Muckraking journalism emerged at the end of the 19th century largely in response to the excesses of the Gilded Age, and Ida Tarbell was one of the most famous of the muckrakers. Born in 1857 in a log cabin in Hatch Hollow, Pennsylvania, Tarbell’s first dream was to be a scientist. Science was a field largely closed to women, however, and she instead pursued teaching, a profession deemed more suitable for a woman. In 1883 she met Dr. Thomas Flood, editor of the Chautauquan, a magazine published in nearby Meadville, Pennsylvania. Flood was about to retire his position and he asked Tarbell to assist him for a few months while he searched for a successor. She accepted and ended up working at the Chautauquan as a writer and editor for six years. Writing became Tarbell’s passion. 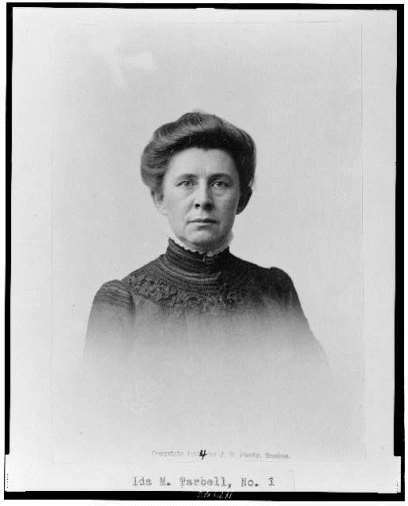 One of her biographers, Kathleen Brady, wrote of Tarbell that “the sight of her work in type was like magic which dispelled forever dreams of botany.” Keenly aware of social problems since her days as a teacher, Tarbell wrote about inequality and injustice and encouraged colleagues at the Chautauquan to do likewise. In 1890, Tarbell moved to Paris. She had written a series of articles about women of the French Revolution and she went to France to research a projected biography of one of those women, Madame Marie-Jeanne Roland. She supported herself by writing articles about Parisian life for Scribner’s Magazine and other American publications, including several owned by Samuel McClure. One result largely attributable to Tarbell’s work was a Supreme Court decision in 1911 that found Standard Oil in violation of the Sherman Antitrust Act. The Court found that Standard was an illegal monopoly and ordered it broken into 34 separate companies. Bloodied, Rockefeller and Standard were hardly defeated. Rockefeller maintained huge holdings in all 34 companies and the breakup actually proved enormously profitable. He lived out the rest of his long life with his status as the world’s wealthiest man unblemished. In 1906, not long after her rise to fame, Tarbell purchased a home in Easton, Connecticut. Easton was a farming town and she used the home and its 40-acre spread as a country getaway for the next 18 years while living primarily in New York City. She lectured widely and continued writing for important publications of the time, like the American Magazine, of which she was also co-editor. 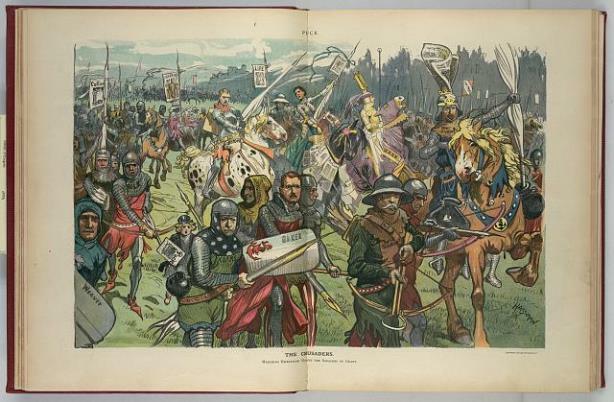 Among the events she covered were the negotiations in Versailles at the conclusion of World War One. In 1924, Tarbell moved permanently to Easton. She was 67 but she kept writing, producing, among other works, an autobiography entitled, All in the Day’s Work. She took ill with pneumonia in December 1943 and died in Bridgeport Hospital on January 6, 1944, at age 86. The History of the Standard Oil Company remains a classic of investigative reporting, and Tarbell’s legacy as a someone who took seriously the credo that journalists should “afflict the comfortable and comfort the afflicted” lives on. The house she lived in in Easton became a National Historic Landmark in 1993. Tarbell, Ida M. All in the Day’s Work. New York, NY: The Macmillan Co., 1939. Brady, Kathleen. 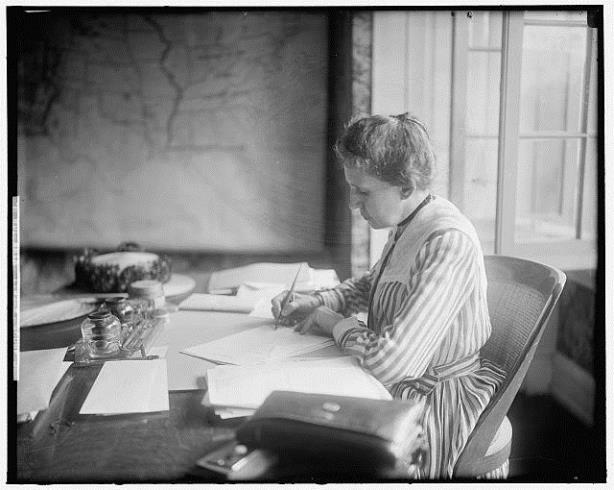 Ida Tarbell: Portrait of a Muckraker. New York, NY: Seaview/Putnam, 1984. Tarbell, Ida M. The History of the Standard Oil Company. Vol. 2. New York, NY: McFarland & Co, 1905. Link. Tarbell, Ida M. The History of the Standard Oil Company. Vol. 1. New York, NY: McClure, Phillips & Co., 1905. Link.